Returning from Jamaica a few weeks ago I was excited to make something using jerk seasoning. 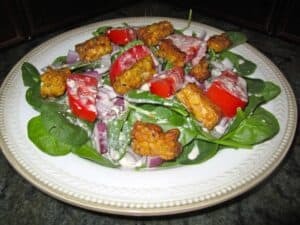 I ultimately decided on this salad: fried jerk tempeh with creamy jerk dressing. It’s got some kick! Make extra tempeh as the leftovers were really good in lavash wraps. Roll together the tempeh and whatever salad vegetables you have into a wrap; dip into the dressing. Perfect 1-2 punch for weeknight dinner and lunch the next day. Combine all ingredients for the jerk rub except for the oil. Reserve 3 tablespoons rub (about 1/2) for the dressing. Combine the rest of the rub with the oil. Dice the tempeh into 1″ cubes and toss with the rub. Set aside for 15 minutes while you prepare the salad and dressing. Wash and tear the spinach into bite size pieces. In a large bowl combine the spinach with diced tomatoes and red onion. Feel free to add as many vegetables as you like here! Make the dressing: whisk together the mayo with the juice/zest of the lemon and lime. Add the 3 tablespoons reserved rub and stir together. In a skillet pan, heat the 1/8 cup oil over medium/medium-high until hot. The easiest way to test the temperature is to test a piece of tempeh. Place a small piece in the skillet, if the oil bubbles around it and sizzles- it’s hot enough. With tongs, place the tempeh into the oil trying to leave as much of the spice rub as possible on. Watch out for splatter! Flip after 2-3 minutes per side until crispy. Transfer to a plate lined with a paper towel or cloth. 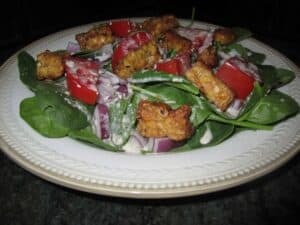 Add crispy tempeh pieces to the salad. Toss with dressing and serve! If you don’t like tempeh, feel free to substitute any other protein here. Chickpeas and eggplants make a great alternatives. Marinade and lightly fry as you did the tempeh. The possibilities are endless! From the tropics to your table! If I can’t still be in Jamaica at least I’ll eat like I am. Hi Alexandra! 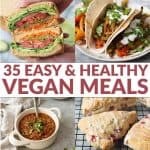 Great idea for tempeh! I’ve had some sitting in my fridge and now I know what to do with it! Great Lisa! Let me know how you like it. Hey Alex! 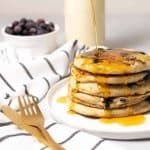 Recipe looks delicious! Unfortunately, I have a family history of hypertension and try to limit my sodium intake. Can you suggest any tasty alternatives to table salt that don’t compromise the flavor? Thanks!! Sure HS, there are lots of salt substitutes on the market that you can use in place of salt. When purchasing items, try to use as many fresh items as possible: fresh vegetables over canned or always rinsing vegetables/beans in cans. If you purchase meat: check the label! The words “pre-basted” mean lots of salt has been added. Most chicken breasts are soaked in salt water to plump them up and make them weigh more so always check the labels for added salt solutions. Other high salt foods to cut back on: hot sauce, canned pasta sauces, instant noodle packets, salsa, lunch meat, salted nuts, olives. As far as cooking, fresh herbs are a GREAT way to add flavor without salt. A little acid from lemon juice or lime juice adds flavor without salt. Try the JERK salad without adding salt- it’ll still taste great!